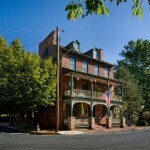 This inn, originally from the 1820s, is said to be haunted by the men who worked nearby as well as many other spirits. The ghost of a young girl with blonde hair has been seen, dressed in Victorian clothing, and the staff says she likes to play games. Kitchen employees report seeing objects that move on their own, or finding utensils strewn all over the kitchen. Guests here have noted cold spots and eerie feelings, and have seen apparitions of men and women: Room 6 is said to be an especially active room. The tavern also is said to be popular with the spirit set. Apparitions and cold spots have been noted throughout, and a ghostly woman named Annie is said to flirt with tavern patrons. 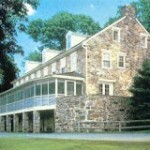 This inn is definitely haunted. The stereo in the kitchen turned on by itself, we recorded a couple really weird breaths on our EVP and also heard a few other strange sounds while investigating. When we got up to our room I clearly heard what I realized in the morning to be a barstool moving downstairs. We were the only ones staying there. We heard many other banging sounds throughout the night that were definitely not “the building settling”.